The Governing Board of the Hemet Unified School District, on nomination by Trustee Ross Valenzuela, has selected Timm Hannem, Student Body Activities Assistant at West Valley High School, as the March recipient of the Governing Board Recognition and Award. 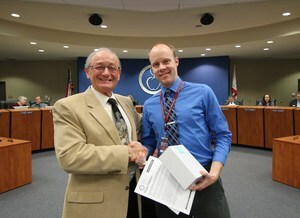 Mr. Hannem is a former graduate of West Valley High School. He received his Bachelor’s Degree in History from the University of California, Berkeley in 2007. Timm returned to Hemet Unified as a substitute teacher in 2007 and currently serves as the Student Body Activities Assistant at West Valley High School. For outstanding performance, professionalism and loyalty to the Hemet Unified School District, President Ross Valenzuela presented Timm Hannem with the Governing Board Recognition of Excellence Award and a $500 certificate to be used toward the District program of his choice.